Over the years I have spoken with thousands of women who are struggling in their marriages and here’s what I’ve found: 90% of these women will not ever make a genuine attempt to fix the problems in their marriages. Sure, they might pick up a book or vent to their girlfriends about their husbands, but that’s not making a conscious, concerted effort to changing how you show up inside that relationship to see if the marriage can be saved, to see if it can somehow feel good again. Reconnecting with a distant husband is hard…and scary. You don’t really know what to do in order to re-connect…and frankly, those actions feel awkward at best and terrifying at worst. And when you’re really honest with yourself, when you make an effort to fix it and it’s unsuccessful, then you have to face an answer about your marriages that you really don’t want. We think re-connecting with our husbands have to do with the action we’re taking…touching again, hugging or kissing, talking consistently, or my personal favorite date nights (ick…). Most of my clients cannot fathom doing these things at this point in their marriages. They haven’t been affectionate in months, some of them years. They talk, but it feels forced and it’s mostly about their jobs or the kids. And date nights? Well, that simply shines a light on the width of the disconnection between the two of you because there’s either nothing to say or you end up in another argument. Most won’t fix their marriage because they simply don’t know how and everything we’ve been told over the years (like schedule date nights!) doesn’t work. The national average is that between 40-50% of marriages end in divorce. But that data point is across the entire population of marriages, not marriages in trouble or disconnection, like virtually everyone who reads or follows my work. So I feel confident in saying that the percentage of people reading this that will go through a divorce is higher than the national average. While the remaining 50% or so may not necessarily go through a divorce, their fate could be considered worse because they will likely remain stuck, unhappy, feeling lost and alone in their marriages – not fixing the problems to it can feel good again and not leaving either. Breaking their own heart Every. Single. Day. 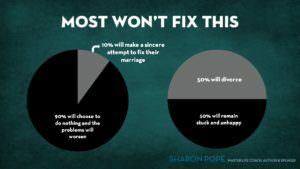 There are 10% of you that are sincerely ready to step forward and make a real effort to save your marriage. Ten percent who want to see if they can create a new relationship with their husband – one that looks and feels dramatically different than it does right now. If that’s you – if you are that 10% – then I want to talk with you and see if I can get you to where you want to go. Clear. Confident. Knowing. Loving. No Regrets.